for the small Vintner ! One of the greatest tools in my home winery ! 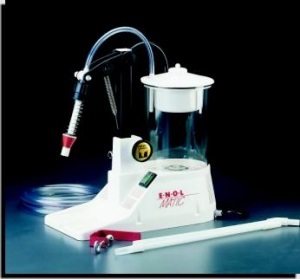 The Enolmatic bottle filler is a vacuum pump designed to fill your bottle by drawing directly from your carboy or barrel. .
An adjustable nozzle evacuates air from the bottle then gently fills and automatically shuts off at your determined fill level. Here I'm calibrating the bottle fill level and running a sulfite solution from a small carboy to sanitize before bottling. 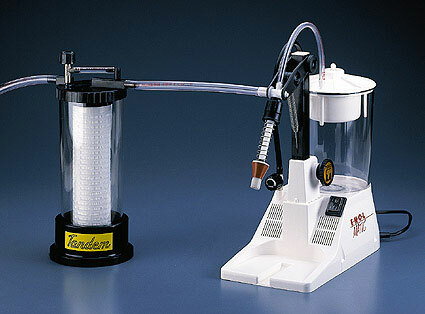 Insert one end of the hose in your carboy (or barrel). 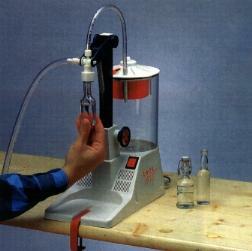 Insert a bottle and turn the system on to start filling your bottles. With the setting set to slow, I filled and corked 2 cases in 20 minutes and didn't spill a drop! It's auto-stop feature is wonderful if you get called away or need a break. It's rated to 200-250 bottles per hour (approx. 1 barrel per hour). The optional Demi John attachment makes racking a breeze. 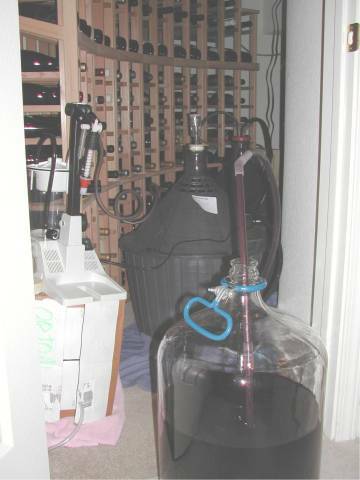 Here I'm racking from the back Demi John to the carboy in front. NO Lifting and NO MESS ! 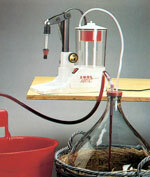 The Demi John Kit includes an adapter to fit both standard Demi Johns and 3-6 gallon Carboys.